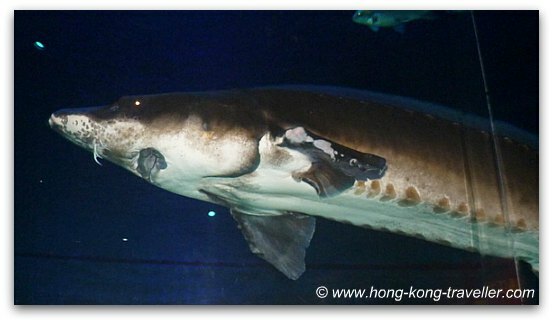 Ocean Park's One-of-a-kind Exhibit of the "Living Fossils"
The Chinese Sturgeon is truly a "living fossil". This animal dates back over 140 million years to prehistoric times when the dinosaurs also inhabited the land. It has basically remained unchanged since then, according to sturgeon fossils that have been found. The Sturgeon and its species have survived major extinction events, but it is currently critically endangered or at risk of extinction, the highest risk category assigned. A species that is "critically endangered" is one that its numbers have or will decrease by 80% in three generations. It is considered along with the Giant Panda, one of China's National Treasures, and we are very fortunate to be able to admire both of these creatures at Ocean Park. 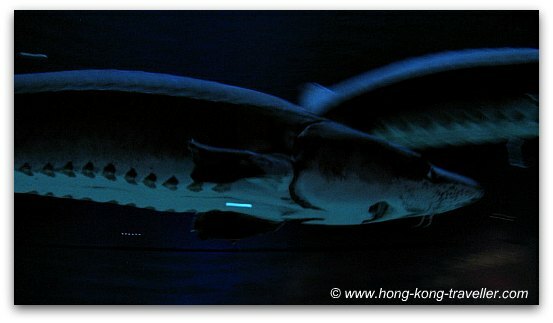 The Chinese Sturgeon is unique to China and is found mainly in the waters of the Yangtze River. 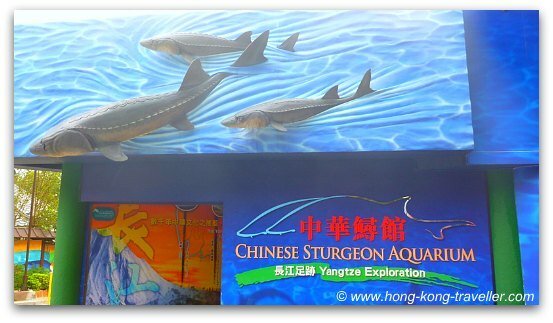 The sturgeons housed at Ocean Park are the first ones to be sent outside of Mainland China, making this a very unique one-of-a-kind exhibit. 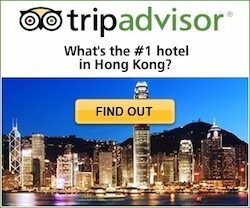 Five of these rare animals were presented to Hong Kong in 2008, to commemorate the Beijing 2008 Olympics, the five Sturgeons were to represent the Five Olympic Rings and to become ambassadors for the species conservation efforts. 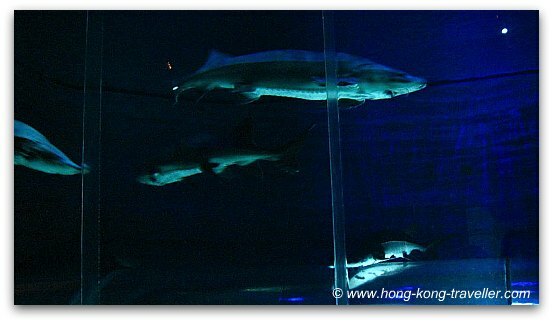 The new arrivals were to be housed at the new dedicated Chinese Sturgeon Aquarium at Ocean Park, which opened on August 8, 2008 for the opening of the Beijing Olympics. 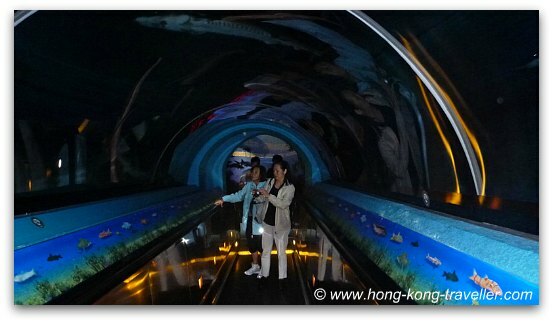 This was formerly the Shark Tunnel, the then resident sharks have been relocated to the Grand Aquarium. 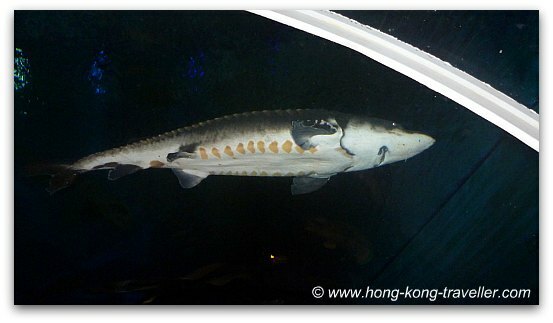 The Sturgeon Tunnel is a wonderful exhibit where you watch them in action and learn about their habits and habitat, the species challenges and the conservation efforts being made by both the mainland and Hong Kong. This animal is a large fish, adults can be as long as 13 feet or 4 meters and weigh over 900 pounds or 400 kilos. The elongated body is easily recognizable and unlike fish, it has no scales but scutes which are like bony plates. The mouth is under the jaw and nearby has four barbels which are whisker-like filaments growing from the snout and are the tactile organs used for finding food as they roam the bottom. Don't miss the chance to see them if you are at Ocean Park, they are really a treasure. You can find this wonderful Aquarium in the Summit area of the park.